The aim of our study was to compare height and weight parameters of the children aged 1-14 years old in Voronezh region of the Russian Federation for the following periods: 1997-1999 and 2011-2014. Material and Methods ― The research was held for 4,940 healthy children in 2011-2014 and 10,247 children in 1997-1999. Body height and weight were examined using standard methods. The percentile method was used to determine percentile corridors as follows: 3rd, 10th, 25th, 50th, 75th, 90th, 97th and perfom comparative analysis. Results ― The children of Voronezh region in 2011-2014 had higher rates of growth reference in comparison with the same data in 1997-1999. The biggest difference in the parameters of height of boys and girls was at 1.0-4.5 years-old group (p<0.05). The most significant difference in weight was at the age of 4-10 years old. It is interesting that growth reference of girls at the puberty period (14 years old) does not change in comparison with 1997-1999 period. Conclusion ― We found that today decade weight of children is significantly higher than that of the children at the end of the previous century. 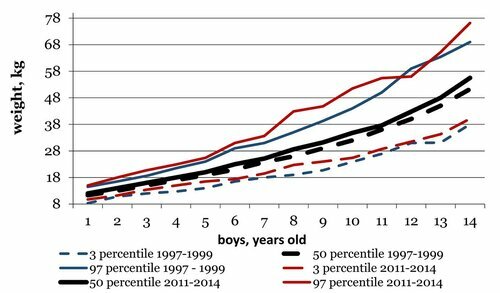 These data reflect fact of acceleration and obesity and overweight problem among the children in the modern world. Nastausheva TL, Zhdanova OA, Minakova OV, Logvinova II, Ippolitova LI. Comparative characteristics of children physical development in Voronezh Region of the Russian Federation for 15 years. Russian Open Medical Journal 2017; 6: e0102. Height and body weight measurements are very important characteristics describing physical development and health of children of any age. These measurements are influenced by acute and chronic diseases, environmental factors, nutrition and social factors . The development measurements under research are constantly changing due to the changes in life conditions, nutrition and health service quality. The investigations held in 1997-2003 by World Health Organization (WHO) revealed that children’s growth and development were an indicant of some negative health condition . In 1970s-1980s, an acceleration phenomenon was described . Later in 2000s, there were some thoughts about physical development deceleration . For the correct analysis of the children’s health state we need regular measurements of physical development held using a special program. This research gives an opportunity to study the measurements dynamics through time and to calculate regional standard growth and development data. This information helps solve many scientific and social problems in the region such as furniture and clothes size identification for children. This research helps analyze social and economic conditions and environmental influence on socially significant diseases. It brings up a matter of a social target program for children health enhancing. The investigation aimed at comparison of the growth data for the children at the age of 1-15 years in Voronezh region of the Russian Federation for the following periods: 1997-1999 and 2011-2014. The research was held for 4,940 children from 1 to 14 years old in Voronezh region (Russia) in 2011-2014. There were taken 2,500 (50.5%) boys, 2,440 (49.5%) girls. Data obtained during routine medical examinations in Pediatric Polyclinics №3 and №10 in Voronezh city and in the Health Centre of Voronezh Regional Children's Clinical Hospital №1 are used. Whole school classes with children from districs of Voronezh region were examined in the Health Centre, and therefore a representative selection of the school children was received. These analysis data were compared with the same data taken in Voronezh region in 1997-1999, which included 10,247 children . The present study and the previous study were conducted using uniform methodology of measurement and subseguent analysis of the data. In 1997-1999 children’s examinations were performed in Pediatric Polyclinics №3, №10, and №11 in Voronezh city and in Pediatric Outpatient Departments of Central District Hospitals of Voronezh region (Russia). All the measurements were held by specially trained medical staff using a standard method . The children with chronic diseases influencing growth and development and premature newborns were excluded from the research. The percentile method was used to determine percentile corridors as follows: 3rd, 10th, 25th, 50th, 75th, 90th and 97th. For comparison of our data with the previous ones the same percentile corridors were used as analyzed in 1997-1999. All stages of the study approved by the Ethics Committee of Voronezh State Medical University n.a. N.N. Burdenko (Voronezh, Russia). Before inclusion in the study all participants gave written informed consent. Statistical data processing was done with a special application program Statistica 6.1 and Microsoft Excel 2007. To estimate the significance value level of the results (р) in different groups there had been used Student’s t‐test and ann‐Whitney U‐test. Critical significance value level at testing statistical hypothesis was accepted at р<0.05. The growth reference in 2011-2014 was different from 1997-1999 data in all aspects: age groups and percentile corridors. The most significant differences in height were in children 1-4 years old (Figures 1 and 2). 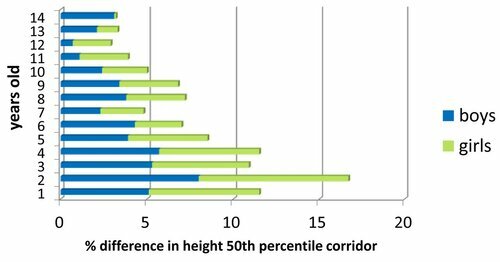 The difference in height 50th percentile corridor is shown in Figure 3. Figure 1. Comparative characteristics of boys’ height, 2011-2014 / 1997-1999. Figure 2. Comparative characteristics of girls’ height, 2011-2014 / 1997-1999. Figure 3. Height 50th percentile corridor difference, 2011-2014/ 1997-1999. The height 50th percentile corridor value for boys at 1 year old was 82 cm (2011-2014) and 78 cm (1997-1999) which was 5.1% increase, at 2 years old – 94 cm and 87 cm (8.0% increase), at 3 years old – 101 cm and 95.9 cm (5.3% increase), at 4 years old – 108 cm and 102.2 cm (5.7% increase). Nowadays boys at the age of 1-4 years old grow faster than the same age boys 15 years ago (p<0.05). At the age of 5-10, the difference in height was less significant in the periods under research (2011-2014 / 1997-1999) and at 11-12 years old, it was minimum: 2011-2014 / 1997-1999 height 50th percentile corridor 11-year-olds - 146.5/144.9 cm (1.1% increase) and 12-year-olds – 151/150 cm (0.7% increase). At 13-14 years old boys height nowadays was more than the same parameter in 1997-1999 which is 159.7/156.4 cm (2.1% increase for 13 year-old -boys) and 168.5/163.5 cm (3.1% increase for 14 year-old-boys). 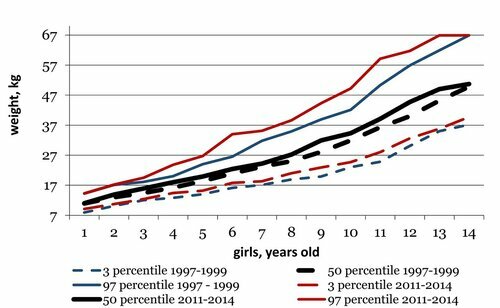 The difference in height 50th percentile corridor value for girls in 2011-2014 and 1997-1999 was in the same categories as boys have. At 2 years old, it was 93.5 cm (2011-2014) and 90 cm (1997-1999) which was 8.7% increase. 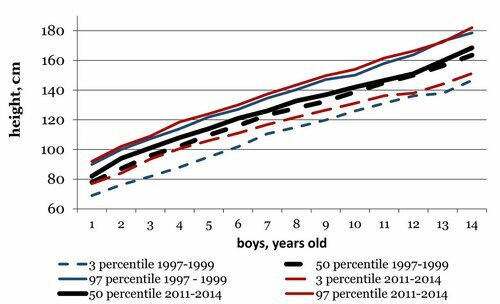 Nowadays girls at the age of 3, 4 and 5 grow faster than the same aged boys 15 years ago for 5.6%, 5.8% and 4.6% (accordingly). The height 50th percentile corridor value for girls at 3 years old was 100 cm in 2011-2014 and 94.7 cm in 1997-1999; for girls at 4 years old it was 107 cm in 2011-2014 and 101.1 cm in 1997-1999 and for girls at 5 years old it was 114 cm and 109 cm accordingly. At the age of 6 12 years old girls height 50th percentile corridor difference was 2.2–3.4%. By the age of 14, the girls’ growth reference slowed down and their body height did not differ from the same parameters in 1997-1999. 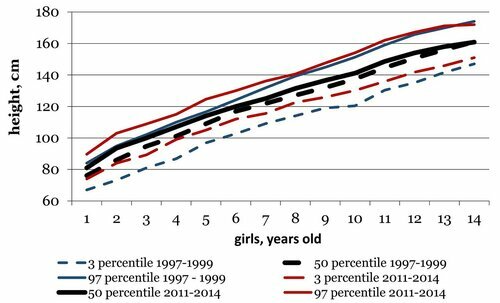 There was no difference between the height 50th percentile corridor values at 14 years old for girls in 2011-2014 and 1997-1999. The most diverse parameters were at 1-5 years old age group at 3rd and 10th percentiles (for 14.4%). The height 3rd percentile corridor value for boys at 3 years old was 93.6 cm (2011-2014) and 81.8 cm (1997-1999); for boys at 4 years old it was 100.5 cm (2011-2014) and 88 cm (1997-1999). The height 3rd percentile corridor value for girls at 2 years old was 84 cm (2011-2014) and 73.2 cm (1997-1999); for girls at 4 years old it was 99 cm (2011-2014) and 86.8 cm (1997-1999). The height 10th percentile corridor value for girls at 2 years old was 87 cm (2011-2014) and 77.8 cm (1997-1999). It means that the number of children with low body height is decreasing in the population under research. The boys and girls body weight in 2011-2014 was 5-19% higher than the same parameter of the boys and girls at the same age in 1997-1999 (Figures 4 and 5). The most diverse data were discovered at the 5-10 years old age group at 3rd, 50th, 75th, 90th, 97th percentiles. 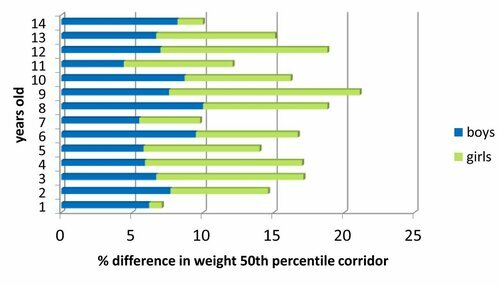 The difference at weight 50th percentile corridor is shown in Figure 6. Figure 4. Comparative characteristics of boys’ weight, 2011-2014 / 1997-1999. Figure 5. Comparative characteristics of girls’ height, 2011-2014 / 1997-1999. Figure 6. Weight 50th percentile corridor difference, 2011-2014/ 1997-1999. The boy’s body weight in 2011-2014 was higher than the same parameter of the boys at the same age in 1997-1999 in all age groups. The weight 50th percentile corridor values for boys were from 4.4% (at 11 years old) to 10.0% (at 8 years old, p<0.05). In an early age boys group the weight 50th percentile corridor values differences were 5.8-7.7%. At the age of 1 the 50th percentile corridor values were 12 kg (2011-2014) and 11.3 kg (1997-1999). We noticed the highest body weight gain at 4–10 and 13–14 years old. This leads us to the conclusion that nowadays there are more children with higher body weight rate than it was in 1997-1999. The girl’s body weight parameters during the periods under research were significantly different as well. The biggest differences of height 50th percentile corridor values for girls in 2011-2014 / 1997-1999 were at 3–4 years old (10.4 and 11.1% respectively), at 9 years old (13.5%) and at 12 years old (11.8%) (p<0.05). The same as the body height rate, the girl’s body weight parameter at the age of one year and 14 years old were nearly the same as it was in the research in 1997-1999. At 90th and 97th percentile corridors, body weight values for boys and girls were significantly higher than the same parameters for the same age groups in 1997-1999. This fact means that nowadays there is an increase in number of children with higher body weight parameters. The research shows that the children of Voronezh region in 2011-2014 had higher rates of growth reference in comparison with the same data in 1997-1999. The biggest difference in the parameters of height of boys and girls was at 1.0-4.5 years old age group. Body weight values for boys and girls in 2011-2014 were higher in all age groups than the same parameters in 1997-1999. The most striking difference was at the age of 4-10. Also the final data of girls’ growth reference at the puberty doesn’t change in comparison with 1997-1999 period. Boy’s growth reference changes during the periods under research. The results we received were changed in accordance with modern conditions, such as lifestyle, nutrition and social factors. We compared our results with studies performed in other Russian regions. Most of the carried out research of children’s physical development in our country indicate an increase in values of height and weight of children at the present stage compared with previous years. Research, held in Nizhny Novgorod, showed an increase in height and weight of today's schoolchildren compared to regional standards in 2002 . Modern schoolchildren in Moscow region were outperformed their coeval in 1980-1990 on based anthropometric parameters . These data prove the fact of obesity and overweight problem among children in the modern world [9-11]. We need to investigate research and compare the physical development values for adolescents at the age of 15-18 years old. Modern children had higher rates of height in comparison with the same data at the end of the previous century. The biggest difference in the parameters of height of boys and girls was at 1-5 years old age group. The weight of modern children is significantly higher than that of the children at the end of the previous century, especially at the age of 4-10. Obesity and overweight are the important problem among the children in the modern world. Haas JD, Campirano F. Interpopulation variation in height among children 7 to 18 years of age. Food Nutr Bull 2006; 27: S212-S223. http://journals.sagepub.com/doi/pdf/10.1177/15648265060274S505. De Onis M, Onyango AW, Borghi E, Siyam A, Nishida C, Siekmann J. Development of a WHO growth reference for school-aged children and adolescents. Bull World Health Organ 2007; 85: 660-667. https://dx.doi.org/10.2471%2FBLT.07.043497. Cole TJ. The secular trend in human physical growth: a biological view. Econ Hum Biol 2003; (1): 161-168. https://dx.doi.org/10.1016/S1570-677X(02)00033-3. Penkin VN, Sitnikova VP. Characteristics of height and weight of children in Voronezh region. Voronezh, Russia, 2003. Russian. Manual on polyclinic pediatrics. A.A. Baranov Eds. Moscow, Russia: GEOTAR-Media, 2007; 608 p. Russian. Bogomolova ES, Kuzmichev YuG, Badeeva TV, Ashina MV, Kosyuga SYu, Kiseleva AS. The physical development of Nizhny Novgorod schoolchildren. Meditsinskiy al'manakh 2012; 3 (22): 193-198. Russian http://www.medalmanac.ru/ru/old/archive/year_2012/number_3_2012/Hygieology/2789. Ogden CL, Carrol MD, Kit BK, Flegal KM. Prevalence of obesity in the United States 2009-2010. NCHS Data Brief 2012; 82: 1-8. https://dx.doi.org/10.1001/jama.2014.6228. Júlíusson PB, Roelants M, Hoppenbrouwers K, Hauspie R, Bjerknes R. Growth of Belgian and Norwegian children compared to the WHO growth standards: prevalence below -2 and above +2 SD and the effect of breastfeeding. Arch Dis Child 2011; 96: 916-921. https://dx.doi.org/10.1136/adc.2009.166157. Valdes Pizarro J, Royo-Bordonada MA. Prevalence of childhood obesity in Spain: National Health Survey 2006-2007. Nutr Hosp 2012; 27: 154-160. https://dx.doi.org/10.1590/S0212-16112012000100018. Tatiana L. Nastausheva – MD, DSc, Professor, Head of Department of Hospital and Polyclinic Pediatrics, Voronezh State Medical University n.a. N.N. Burdenko, Voronezh, Russia. http://orcid.org/0000-0001-6096-1784. Olga A. Zhdanova – PhD, Assistant Professor, Department of Hospital and Polyclinic Pediatrics, Voronezh State Medical University n.a. N.N. Burdenko, Voronezh, Russia. http://orcid.org/0000-0002-3917-0395. Olga V. Minakova – PhD in Technology, Assistant Professor, Voronezh State Technical University, Voronezh, Russia. http://orcid.org/0000-0003-0641-731X. Iya I. Logvinova – MD, DSc, Professor, Department of Hospital and Polyclinic Pediatrics, Voronezh State Medical University n.a. N.N. Burdenko, Voronezh, Russia. http://orcid.org/0000-0001-7042-3402. Ludmila I. Ippolitova – MD, DSc, Department of Hospital and Polyclinic Pediatrics, Voronezh State Medical University n.a. N.N. Burdenko, Voronezh, Russia. http://orcid.org/0000-0001-7076-0484. © 2016, Nastausheva T.L., Zhdanova O.A., Minakova O.V., Logvinova I.I., Ippolitova L.I. Correspondence to Olga A. Zhdanova. Address: Voronezh State Medical University n.a. N.N. Burdenko, 10, Studencheskaya Street, Voronezh, 394036, Russia. Phone: +7 (473) 237-27-46. E-mail: olga.vr9@yandex.ru. Ippolitova, Ludmila I. - Logvinova, Iya I. - Minakova, Olga V. - Nastausheva, Tatiana L. - Zhdanova, Olga A.